LOS ANGELES, July 11, 2017 /PRNewswire/ -- Today, Jam City and Peanuts Worldwide announced the worldwide launch of Snoopy Pop, an all-new bubble shooter game starring the beloved Peanuts characters and Snoopy alter-egos from the classic comic by Charles M. Schulz. Additionally, it was also announced that Jam City, in honor of the Peanuts and Schulz legacy, will make a $100,000 contribution to Canine Companions for Independence, the largest provider of assistance dogs for children, adults and veterans with disabilities, including adults who are deaf or hard of hearing and professionals that work with groups of people with disabilities. Created in close partnership with the artists, animators and storytellers at Peanuts Worldwide, Snoopy Pop gives anyone with a mobile device the ability to help rescue Woodstock and his flock of birds who have been trapped in bubbles. The free-to-play game is available in the App Store (http://jamcity.me/SP_PR_iOS) and via Google Play (http://jamcity.me/SP_PR_GP). "Jam City is proud to be launching a game with one of the world's most iconic brands. Creating a game with Snoopy and the Peanuts gang has been a labor of love for our artists, storytellers and technical teams," said Josh Yguado, co-founder, President and COO of Jam City. "Additionally, and in honor of Charles M. Schulz's legacy and love for the organization's mission, Jam City is moved to be supporting the important work of Canine Companions for Independence through Snoopy Pop. Canine Companions enhances independence by providing highly trained assistance dogs to Veterans and people with disabilities." "Supporting Canine Companions for Independence has a special place in my heart, and this Snoopy Pop collaboration is a fun way to do just that," said Jean Schulz, National Board Member and Chair Emeritus of Canine Companions for Independence and wife of Charles M. Schulz. The Peanuts Gang is Back! "Snoopy Pop is just the type of interactive experience that we love, that bridges Peanuts into this new digital age," said Roz Nowicki, Executive Vice President of Peanuts Worldwide. 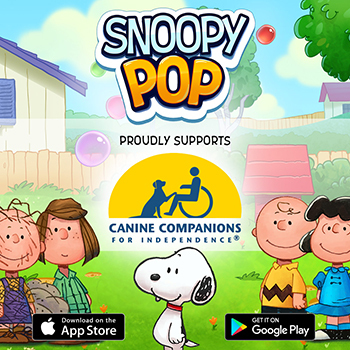 "We are also thrilled that Jam City is supporting Canine Companions for Independence, a charity near and dear to the hearts of both Charles and Jeannie Schulz. The demand for highly trained assistance dogs is ongoing and growing and this will help CCI bring additional dogs to those in need." Jam City has made a science out of turning some of the world's largest entertainment franchises and brands into hit mobile games. The mobile gaming publisher is the creator of 6 of the Top 100 Highest Grossing games played nationwide across both iPhone and Android devices, including Panda Pop, the No. 1 bubble shooter in the U.S.
Jam City is a Los Angeles-based mobile game publisher with global reach. Created in 2010 by former MySpace co-founders Chris DeWolfe, Aber Whitcomb, and former Twentieth Century Fox executive Josh Yguado, Jam City is the creator of 6 of the Top 100 highest grossing games across Apple's and Google's US app stores. Its portfolio of titles--which includes Cookie Jam, Panda Pop, Genies & Gems, Family Guy: the Quest for Stuff and Marvel Avengers Academy--has been downloaded more than 800 million times and is regularly played by more than 50 million people per month. Jam City has studios in Seattle, San Francisco, San Diego and Buenos Aires. The PEANUTS characters and related intellectual property are owned by Peanuts Worldwide LLC, a joint venture owned 80% by DHX Media Ltd. and 20% by members of the Charles M. Schulz family. 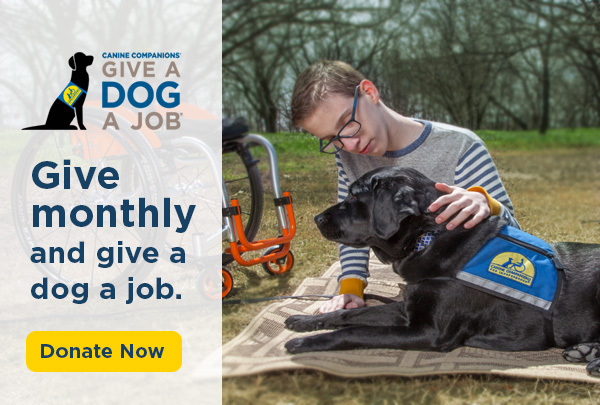 Non-profit Canine Companions for Independence provides highly-trained assistance dogs free of charge to children, adults and veterans with disabilities. Established in 1975, Canine Companions has trained over 5,400 assistance dog teams, with six training centers across the country in Northern California, Southern California, Florida, New York, Ohio and Texas, and over 3,000 volunteers nationwide. Canine Companions is recognized worldwide for the excellence of its dogs, and the quality and longevity of the matches it makes between dogs and people. The result is a life full of increased independence and loving companionship. For more information, visit cci.org or call 1-800-572-BARK.